The countryside surrounding Melbourne is brimming with some of Australia’s top food and wine. Musement chats with the Deeble family, owners of Cloud 9 Farm, a wine and cheese producer in Victoria. It’s no secret that Australia is famous for cutting-edge New World wines, but many seem surprised when learning that Australia produces some cheese on par with France and Italy’s finest. Cloud 9 Farm in Victoria is owned and operated by the Deeble family: husband-and-wife Alan and Susy, and their daughter Jacquie. Located about 90 minutes from Melbourne by car, Cloud 9 makes for a perfect getaway for anyone looking to explore Australia’s thriving gastronomic culture. 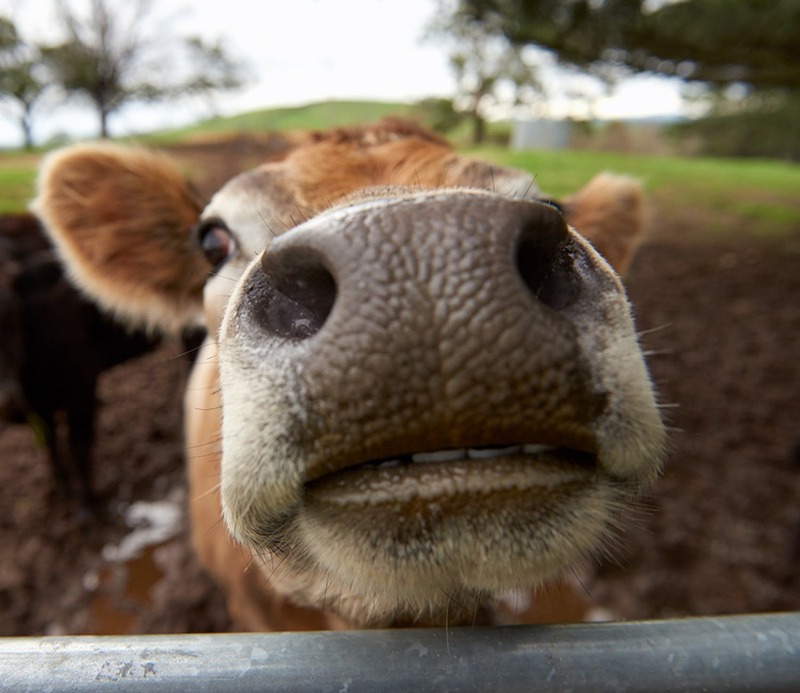 We spoke with the Deeble family to learn more about their farm. Can you share the history of Cloud 9 Farm? How it came into being and how it evolved? Cloud 9 Farm began as an escape from city life, a new life. It started in the year 2000 when we decided to go for a picnic in Kyneton, Victoria. Previously, we had been looking for a country property but had not found what we had been looking for. Just for fun, we decided to look into the window of a real estate agent. Initially, we were just looking for 10 acres but the agent said she had a 20-acre property, which sounded like something that suited our needs. We inspected the property and it just had a feeling about it and exceptional views, and it wasn’t long before we purchased it. The property is elevated at 650m above sea level, and it felt like an oasis compared to the hustle and bustle of city life, so hence the name Cloud 9 Farm. Initially, a barn was built, and Susy and Alan commuted from Melbourne to Pipers Creek whilst the house was being constructed. We wanted to become as self-sufficient as possible – hobby farmers as it was. Grapevines were planted to make wine for friends and family, an orchard and animals were farmed for meat and dairy. About six years ago, our neighbor’s property went on the market so we purchased it to use for the agistment of our animals. Susy had been previously involved with the showing of our cattle (dexters) and had become very passionate about the dual purpose of the animal. She started making cheese out of the kitchen and then her passion grew where she then went on to study cheesemaking and as a result, a commercial cheese room was built on within the new property. Alan had the idea of turning the old log cabin on the neighbor’s property into a cellar door which has sprawling views of the Macedon Ranges and beyond. The log cabin was renovated to include a cellar and indoor and outdoor eating areas. We wanted to show the public what a small farm can do, and the idea of paddock to plate. The idea of educating people on how you can eat and drink something high quality with a little work and love was the message that we wanted to get across. 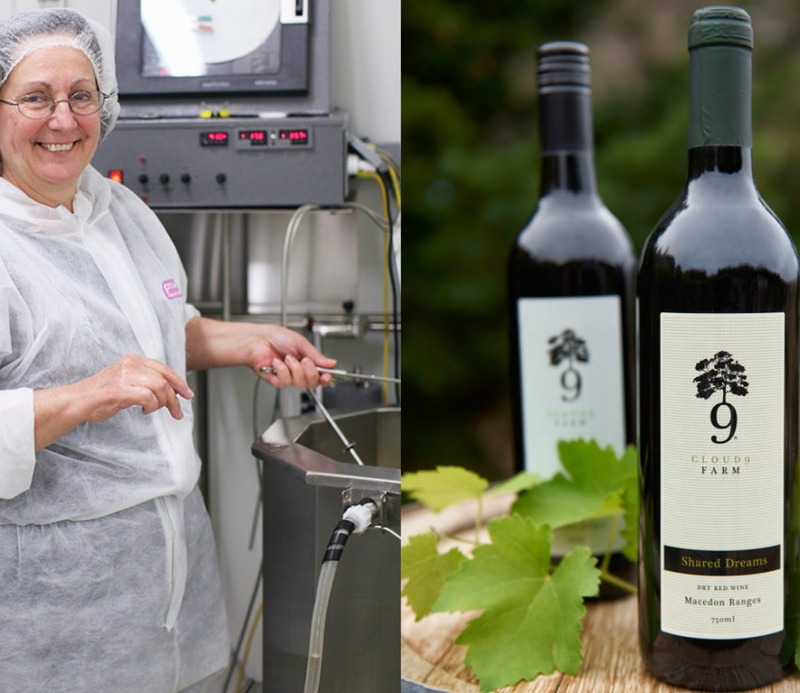 Cloud 9 Farm as a business started in September 2014 where our cheese and wine became available for tasting and purchase from our cellar door. We love that Cloud 9 Farm is a family run establishment. What are your roles? Tell us about your cheeses and how to best enjoy them. We enjoy our cheeses alongside local preserves such as quince, tomato chili jam, and piccalilli pickles along with small goods such as salami and prosciutto. Our Shiraz and Shiraz/cabernet wines are lighter in style and pair perfectly with our cheeses. 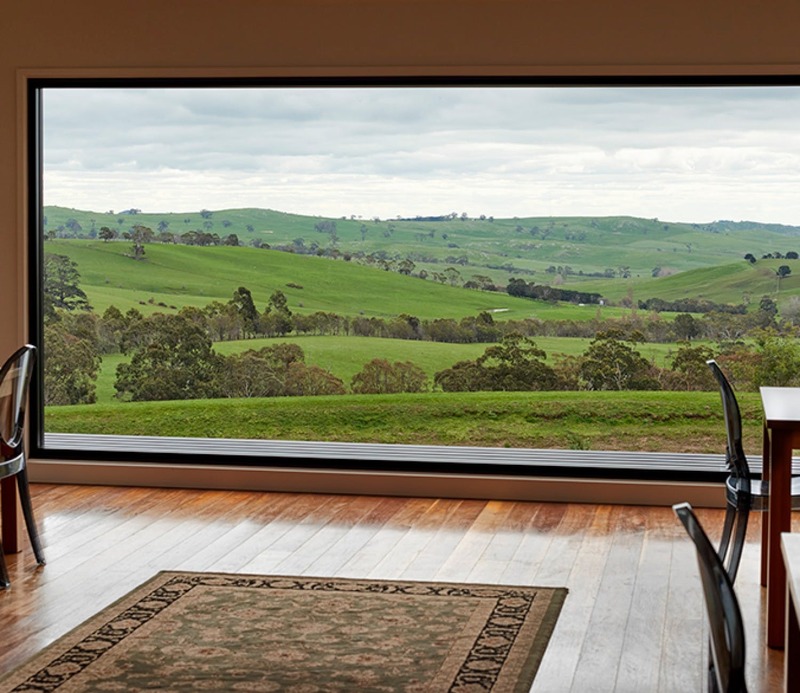 The sweeping view of the gorgeous Australian countryside at Cloud 9 Farm. What are the characteristics of your terroir and how does it affect your wines? We are 650 meters above sea level in a cool climate area of Victoria on ancient alluvial soils (granitic) interspersed with rich red volcanic soil. We tend to look at early ripening varieties such as pinot noir and chardonnay, and we have the natural acids and fruit from the district in our wine. We go through a natural malolactic fermentation that converts malic acid to lactic acid, which marries very well with our cheese. What are your favorite wine and cheese pairings? Grana with our Shiraz/Cabernet 50-50 blend is our favorite wine and cheese pairing. Our Grana is matured for at least 18 months in our underground cellar. Can we find your cheese and wine anywhere outside of Australia? Our cheese and wine are only available within Australia. Can you share some of your favorite things to do in Melbourne? We enjoy going to Melbourne for the fantastic restaurants and coffee. Jacquie also enjoys rowing along the Yarra River. The shopping is fantastic and architecture of the old and new buildings is quite spectacular. Alan loves to head in to watch his beloved Richmond Tigers play Australian Rules Football. What are some of your favorite ways to explore the local countryside? We are fortunate that our property sits on the Cobaw Forest located on the great dividing range, which forms an arch that’s about an hour around Melbourne. Highlights include Hanging Rock and Mount Macedon. 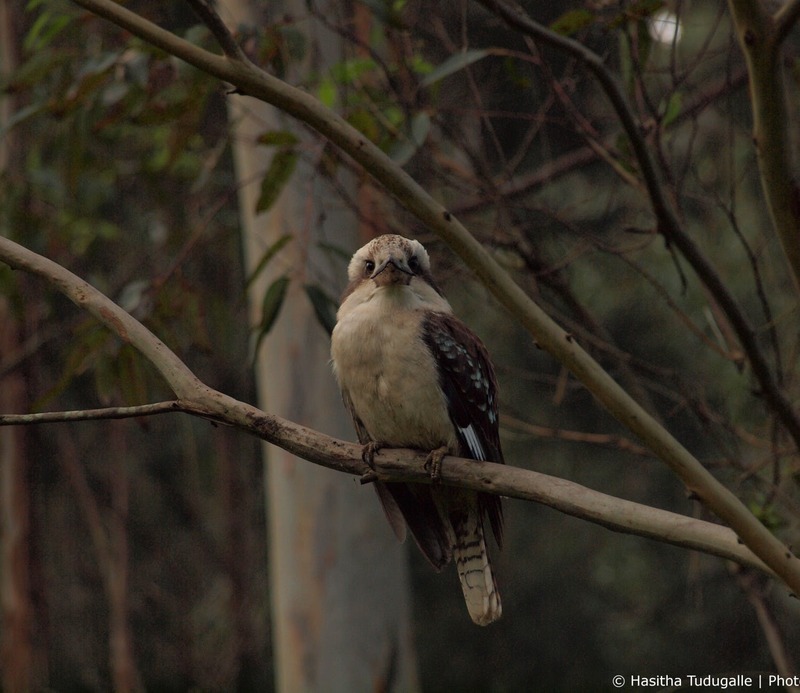 Living on the edge of the forest means that Australian native animals visit us quite frequently such as kangaroos, wallabies, wombats, echidnas, and kookaburras. We enjoy nature and the ever-changing landscape we live on.